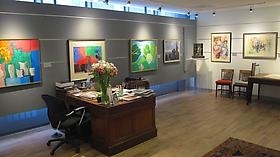 R. S. Johnson Fine Art, now almost 60 years at 645 N. Michigan Avenue, has exciting news for friends and colleagues. Still at the same address, the gallery has moved upwards to an expanded ninth floor headquarters with a spectacular, state-of-the-art exhibition space. Share our views of the Magnificent Mile, and enjoy the works of masters from Dürer to Rembrandt to Picasso. In addition to some of the world’s most distinguished collectors, 62 museums, from Tokyo to New York to Paris, have acquired works of art from R. S. Johnson Fine Art.